This is a view of the landscape around Maroon town, taken from Cynric Williams' 'A Tour through?. 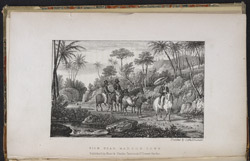 Jamaica,' published in 1826. The men and women known as Maroons were former slaves and their descendants. Many of them had managed to escape from servitude when the British invaded the Spanish colony of Jamaica in 1655; others were successful runaways from captivity on British-owned plantations. They founded settlements in the remote hills and forests, adapting a variety of African traditions to the hostile environment. There were 2 main Maroon groups - the Windwards and the Leewards. The former settled in Nanny Town (named after the woman who had been their spiritual leader) and the latter established 2 towns - Accompong, later known as St Elizabeth, and Maroon Town, which became Trelawny Town following the signing of a peace treaty with the British in 1739.